This page features an original Burger Steak Recipe. See the links at the bottom of the page for other traditional American style recipes. 1. Flatten a beef patty about 10 inches in diameter and about 1/4 inch thick. Season it with Salt and Pepper. 3. Place the hot dog, bun and all, face down in the giant beef patty. 4. Roll the beef patty around the hot dog, and seal the ends smoothly. 5. Sear the whole thing on a grill until browned on all sides. 7. Add more of your favorite condiments. Mine's ketchup. 8. Wrap the whole thing in a giant romaine lettuce leaf. This monstrosity makes about 3 servings. 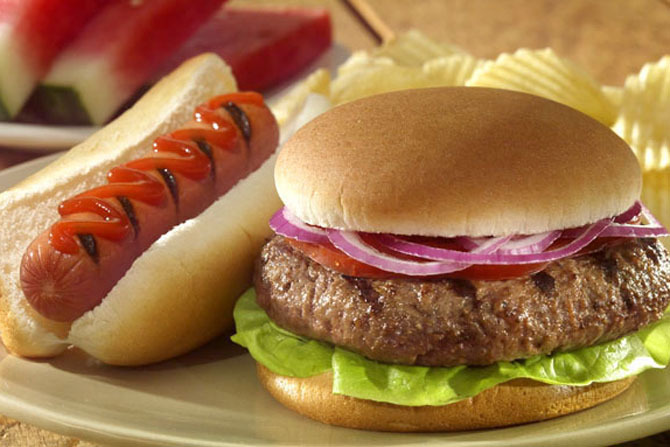 To view more Burger Steak Recipe ideas, and a broader selection of America's most favorite lunch, dinner, and dessert recipes, visit any link shown on this page. Go here to access MORE CORNED BEEF recipes.